Eleventh edition of the TCS World 10K Marathon was held on Sunday the 27th of May 2018 in Bengaluru. 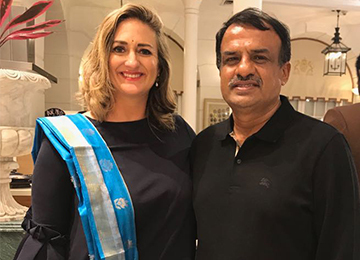 Ms Mary Pierce was the ambassador of this mega event. MsPierce has won four Grand Slam titles: two in Singles, one in Doubles and one in Mixed Doubles. Her Grand Slam Singles title came in the recent past. She is the last French player, to win the Singles title.Mr. ManjunathBhandary, Chairman, Bhandary Foundation was a part of the event. On meeting Ms Pierce, he said that career story of MsPierce inspired the runners of the World 10K. This event is a great way to increase TCS’ engagement with the community, raise funds for charity as well as create societal awareness about the necessity of good health and fitness. Ms. Deeksha Bhandary, daughter of Mr. Manjunath Bhandary was also a part of the event. Ms. Spatika, a friend and classmate of Ms. Deeksha at Rishi Valley School, was present. Ms. Spatika is now into modeling and has been crowned as Miss Hyderabad. Her aim is to become Miss Universe. Likewise, various celebrities took part in the event and ran for a noble cause.